I try to rein in the superlatives, but never in all my days have I been anywhere lovelier than the Caucasus in spring. Being here is an experience that ripples right through me, like opening up to a new love. 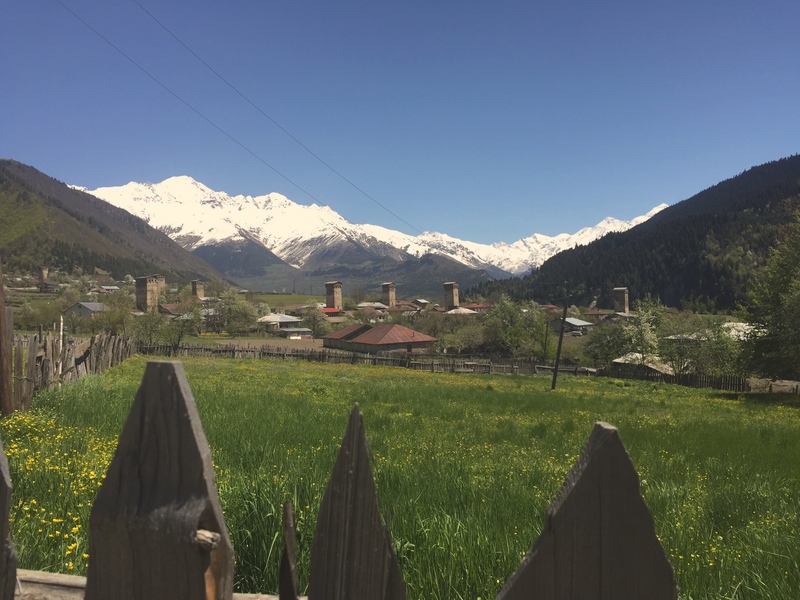 I am staying in a village called Lenjeri in the Georgian region of Svaneti, known beyond its borders for its stunning landscapes, ancient culture and living traditions of music and dance. Let me give some geographical context. The border with Russia is 12 kilometres to the north of Lenjeri. Mount Elbrus, Europe’s highest peak, is about 40 kilometres northwest of me and Sochi, the Russian resort which hosted the last Winter Olympics, some 250 kilometres to the west on the Black Sea coast. 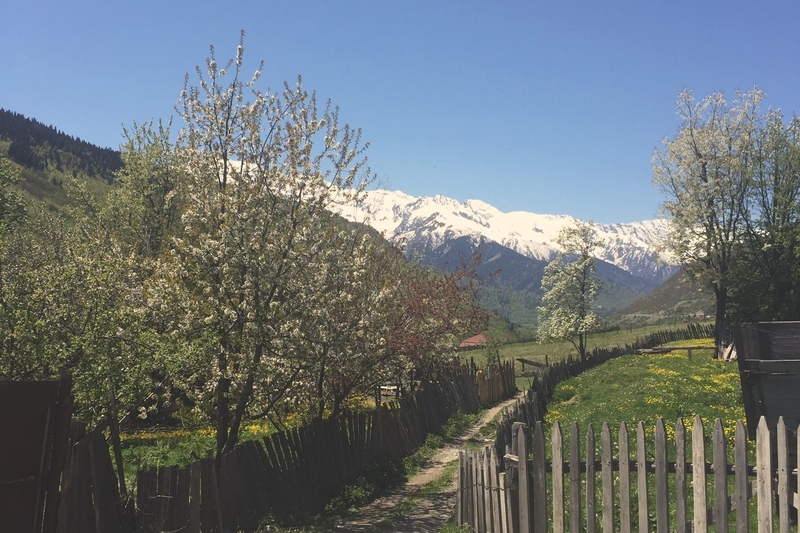 When I walk out of my guesthouse, the view over to the west is to die for – spring flowers, trees in blossom and the heights of the Labskaldi Range covered in snow. To the north and to the east are the snowy peaks that form the border with Russia. Several times now I have walked from my guesthouse along the road to Mestia, a town about 40 minutes by foot to the east. I feel familiar now with the road’s sights and sounds. Every day there are men ploughing the rich earth with oxen, a team of two animals for one plough. Pigs usually scavenge by the roadside. Up on the wooded slopes towards Russia, I often hear a cuckoo sing. I see the distinctive Svan stone towers built over the centuries to protect villagers from attack. The culture of Svaneti is rich and the people here have their own unwritten language, related to but distinct from Georgian. The region reminds me a little of Transylvania, in the sense that it is another example of a peasant society producing much of its own food and another great feast for the eye. 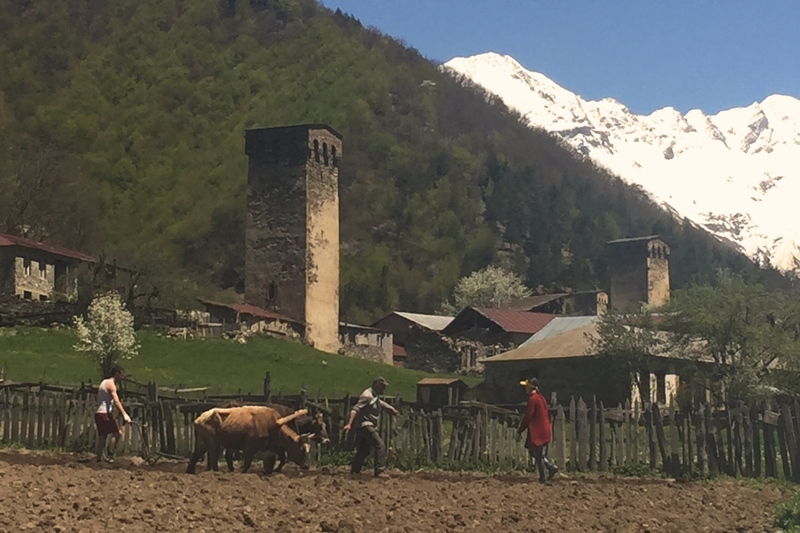 In case you decide to come to Svaneti, let me give you the lowdown on how to get here. Leaving Samgori station, emerge onto the road and turn right. After about 100 metres there is a small area where a few minibuses are usually parked and a sign in the English alphabet says Mestia. The vehicle turns out to be a Nissan Serena SUV. For the first hour we do the rounds in Tbilisi, picking up passengers. Eventually we set out with Giorgi at the wheel, plus five adults, two children and luggage. As the solitary foreigner, I get the seat of honour in the front. The journey takes us past Gori, Stalin’s birthplace, where the Caucasus are already in view. We continue to Zugdidi, not far inland from the Black Sea. To the Anglo-Saxon ear, this name does not sound promising, but Zugdidi turns out to be a fetching town with fountains, gardens and views of the snow-capped ranges to the north. There’s a moral here somewhere. After Zugdidi we start to climb and soon Giorgi is negotiating a serious mountain road. For lunch we stop at a roadside restaurant in the mountains. Driver and passengers sit at one table. Tasty Georgian fare appears and we all tuck in. Giorgi refuses to let me make any financial contribution to lunch and we press on. I have a contact in Svaneti, the friend of a friend of an old Reuters pal. His name is Vakhtang Pilpani. 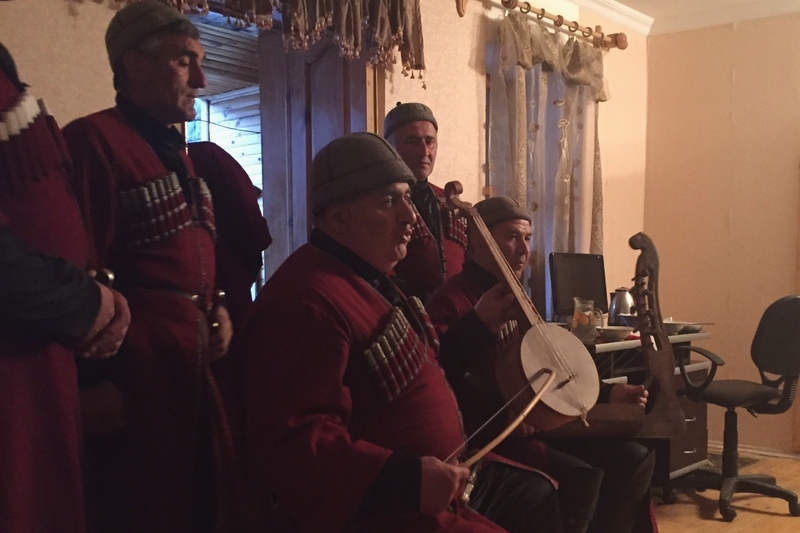 Both he and his father are noted musicians in Svaneti and he runs a guesthouse. Giorgi calls him on his mobile and says that we have reached his village, Lenjeri. Giorgi has barely finished the call when we stop in front of a vehicle parked in the road. It is Vakhtang. With black pigs scampering at our feet – there are always animals on Georgian roads – we transfer my luggage to Vakhtang’s vehicle. Almost immediately Vakhtang delivers a short discourse on the English language. I discover that English is actually Vakhtang’s fourth language after Svan, Georgian and Russian. When I tell him that I have some Russian he is visibly relieved. I have been chilling out in Vakhtang’s comfortable home, just drinking the place in. I love the names of the mountains. Ushba, Tetnuldi, Shkhara, Akhalgazrdoba, Chkhunderi, Mudurbani. They are such appropriately hard names for mountains made of granite and shale. When I hear a Svan speak the name of Ushba or Shkhara I feel I am listening to a character straight out of the pages of Tolkien. Some of that granite has surely entered Svaneti’s DNA – these people are tough. They are also skilled musicians, producing deep, sonorous sounds that go back so far in the human story. Svan music is known internationally and Vakhtang tells me that his father, Eptime Islam Pilpani, now 81, has been to Paris three times to perform as a musician. I am lucky enough to hear Vakhtang and his music group play for some German tourists. Vakhtang tells them that several of the songs the group is singing date back 4000 years. The evening’s entertainment includes a virtuoso linguistic performance. The tourist group leader, a young Svanetian woman, translates all of Vakhtang’s comments, spoken in the Svan language, into German. As she tells me: “Es ist nicht einfach.” Not easy at all, I can imagine, but this tour guide, Tea Totogashvili, surely has one of the world’s ultimate niche products. To see more of Svaneti I will be travelling by foot. Mestia is the end of the road for all motorised transport except jeeps. I hope to set out soon with a trusty guide.